Sign Up to our Mailing List to get our Exclusive Discount Vouchers! Underlay isn’t visible but it plays a pivotal role in providing a robust foundation for your carpet, by offering support, strength, additional cushioning made from compressed foam materials. Although underlay is hidden, you’ll definitely spot the extra wear and tear on your new carpet if you pick an inadequate underlay material. At Karpet Kingdom, our staff are more than happy to provide underlay recommendations and advice. 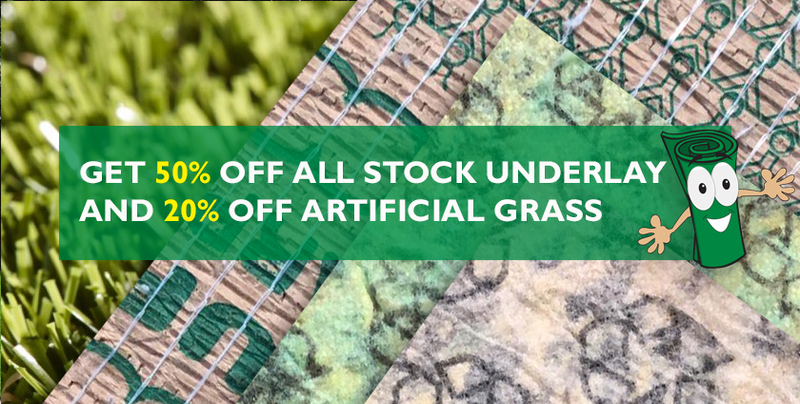 For a limited time only, you can get a whopping 50% OFF Stock Underlay, so don’t miss out on the chance to give your new carpet the support it needs! Karpet Kingdom are delighted to reveal that we can now offer a stunning range of Artificial Grass – with different characteristics to suit your every need – with 20% OFF when you sign up to our mailing list! Whether you want an exquisitely green garden, a safe play area for the kids or a rooftop design, we can offer you a high quality, durable lawn, which will look incredible all year round. Shop Karpet Kingdom’s range of Artificial Grass today with 20% OFF and you could have your new lawn fitted in time for the summer sun! *Discount can only be used at time of purchase and no credits or refunds can be given. *Discount can’t be used in conjunction with any other offers.